TEL AVIV — More than any other Jewish text, the Passover Haggadah — the book that guides participants through the Seder — is a quilt sewn over generations. It is mysterious and beautiful, and often restless. It weaves together social justice (inviting the needy to join the meal), storytelling (about how our forefathers were enslaved in Egypt), ceremonial symbols (unleavened bread and a shank bone, to name just two), pedagogy (asking questions from a wise son and a wicked one), celebration (for the Exodus) and pleas for help (“Pour out Your wrath upon the nations who do not know You”). The Haggadah also encapsulates two competing instincts in Jews today. On one hand is the tribal-national sense of peoplehood — the Exodus from Egypt represents the creation of a people, the Jewish people. On the other hand is the universalist-humanist — the Hebrews’ emancipation from Pharaoh has become a symbol of freedom from oppression, and “Let my people go” a rallying cry everywhere. Because it reconciles these two threads in Jewish life, Passover is appreciated by nearly everyone in the Jewish community and more widely observed than any other holiday. In Israel, more than 90 percent of Jews celebrate Passover; in the United States, 70 percent. But this holiday can also be a moment of polarization, and the Haggadah can be a Rorschach test as Jews choose competing interpretations. Jews today use the Haggadah to emphasize social justice, feminism, secularism, vegetarianism. Some add a fifth cup of wine to the traditional four either to note the ultimate “redemption,” the establishment of the State of Israel, or to celebrate Moses’s sister Miriam, and the role of women throughout Jewish history. For many generations, this is how we answer this question — as the Haggadah guides us. For many generations, we have followed a script. There is an answer for the wise son, and an answer for the wicked son, one for the simple son, one for the silent son. The Haggadah doesn’t tell us how to answer the son who cannot stop talking about the news, not even for one night. Maybe it is hinting that he does not merit an answer. Passover is a Jewish holiday that commemorates the emancipation of the Jewish people from slavery in Egypt. It typically falls in early- to mid-April, coinciding with 15th to the 22nd of the Jewish month of Nissan, based on the lunar calendar. People who observe Passover will attend a Seder, a dinner where the story of the Exodus from Egypt is recounted. Seder means ‘order’ in Hebrew because the Seder ritual is performed in a specific order. People celebrating Passover may abstain from eating leavened bread and eat Matzo, which is a kind of unleavened bread, instead. 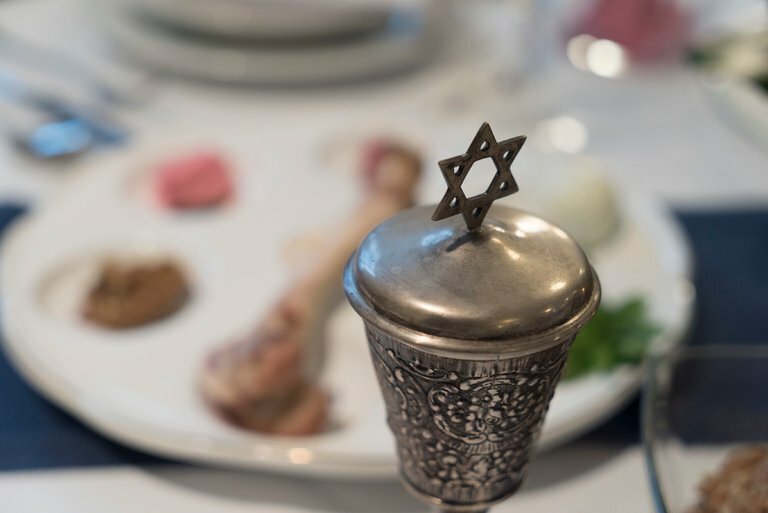 The four main events at a Seder are eating matzo, eating bitter herbs, drinking four cups of wine associated with blessings and reading from the Haggadah, or book that tells the Passover story. Judaism teaches that the Jews were living as slaves in Egypt, forced into heavy labor and poor living conditions. God heard their cries and sent Moses to free the people from the Pharaoh's rule. Moses asked Pharaoh to "Let my people go." When Pharaoh refused, God unleashed a series of 10 plagues upon Egypt. Moses asked Pharaoh for the Jews' freedom after each of the plagues. When Pharaoh rejected Moses' requests, a new plague struck Egypt. After the last plague, the killing of the first born sons of Egyptians, Pharaoh relented and the Jews were set free. The first born sons of Jewish people were spared, or "passed over," which gives the holiday its namesake. The Jews packed up their belongings, but did not have time to wait for their bread to rise, baking Matzo instead. Pharaoh however changed his mind and sent his army after the Jews. Once they reached the Red Sea, the Jews feared they were trapped. Instead, the Torah teaches that God parted the Red Sea allowing the Jews to walk through to safety, but closed the sea again as Pharaoh’s army tried to follow. 0 Response to "Keep Your Politics Out of Passover"